Since my time in Lower School at Friends, I have always heard about the annual Lunar New Years event. However, it wasn’t until this year, my last year at Friends, that I was finally able to go. I was really excited when I heard about the opportunity to volunteer. 22 years ago, Henry Lee, the first Asian American to graduate from Friends, was honored by his family with a named scholarship. Proceeds from the Chinese New Year Celebration benefit the Henry Lee ’43 Scholarship Fund and the Boji ’92 and Richard ’98 Wong Family Chinatown Scholarship. At the event, I worked selling small trinkets and other items to lowerschoolers and their families. All of the proceeds went to the aforementioned scholarship funds. I had fun selling the items, not only because I knew the proceeds went to such a great cause, but also because I had the opportunity to interact with the lowerschoolers who were attending the event. It was amazing to see the lowerschoolers so excited to learn about Chinese culture and heritage. My favorite part of the night was when I helped spread bubble rap on the floor so that the lower schoolers could jump on it, a Friends Seminary substitute for firecrackers. If you want free Chinese food and the opportunity to give back to the present and future Friends community, the Lunar New Year celebration is the place to be! This summer, I volunteered as a counselor at Friendship Circle Summer camp. Friendship Circle is an organization that aims to give children with special needs the opportunity to interact with each other and with mainstream teenage volunteers. I have volunteered with the program before – in both their Sunday Circle program (in which volunteers spend 3 hours with children every other Sunday) and in their Summer Camp. 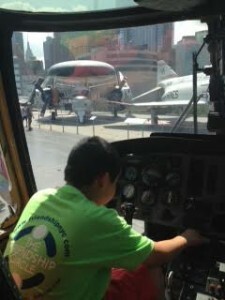 The summer camp is a week-long program of activities in art, cooking, sports and music as well as two field trips to the Intrepid and a playroom. These activities are aimed to help the special needs children, most of whom are in a twelve-month school program, enjoy a “normal” summer during their short break. It was nice returning to an organization with which I already had worked– I knew some of the other volunteers, the directors, and even some of the children. However, this summer brought new experiences as I was paired with a new child – Martin, a nine year old autistic boy. When my two fellow volunteers and I first met Martin, we thought he was non-verbal. When we offered him crayons to draw with or an arts and crafts project to do, he did not reply and instead ran away. However, throughout the week, Martin opened up to us. He talked to us, giving short answers to our questions and shared with us his amazing drawing skills (I wish I had a picture of one of his projects). Martin and the other children at Friendship Circle certainly demonstrate the truth of the prompt: “equality begins with the belief that Light is present in us all.” These children’s light certainly deserves to be admired. Many of the children at Friendship Circle are surrounded 24/7 by therapists, doctors, and parents. But through their smiles, laughs, drawings and words their light shines brightly. I am thankful I got to share a week of my summer with them. Martin in a helicopter at the Intrepid! http://www.friendshipnyc.com/ <– click here for information about their programs (they also have multiple locations). I highly recommend this organization.